These ProBiltSeries Knee Pads are designed with a high-density foam inner pad that provides maximum comfort and protection. Rubi Professional Knee Pads are made from a single piece of foam material that conforms to the shape of your knee over time, which makes them very comfortable. Superiorbilt's Platinum Knee Pads are designed for comfort, offering a custom fit with designated Left and Right display to match your knee caps. 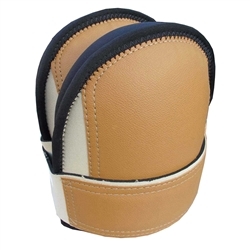 Troxell LeatherHead Knee Pads will protect your knees without painful buckles and straps pinching behind your leg. Troxell SuperSoft Knee Pads have a cushioning non-liquid gel pad up front for comfort while the strong velcro front fastener stays in place and allows a free range of motion.